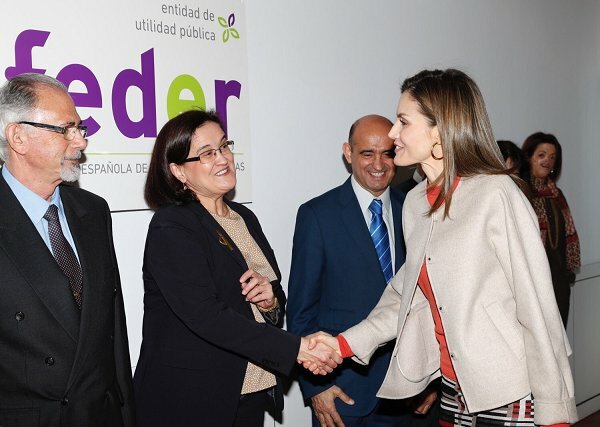 Queen Letizia of Spain attends a meeting of the FEDER (Spanish Federation for Rare Diseases) at FEDER headquarters on January 12, 2017 in Madrid, Spain. Queen Letizia wore HUGO BOSS Hesandra Pixel Tweed Skirt. Love the outfit, love the colors, love the shoes. Yaaaay for the block heel! I like the dress, shoes, bag and jacket but not together. I like this. It´s on the casual side, and I really would prefer the jacket sleeves at full length rather then folded up like she did, but is´s a very approachable look that´s flattering and interesting. Just the right amount of retro touch without overdoing it. She looks great and continues her important support for people suffering from Rare Diseases. Loving the shoes and skirt! Beautiful colour-combination! But I have learned from my mom not to wear brown shoes with a black bag. I think this rule is not applicable nowadays any more, but I still stick to it. I love it all. The colours are great. She really does "business chic" so well. She looks dressy but also, as Vanessa said, approachable. Love how Letizia re wears her outfits. Excelente aspecto, bonito, cómodo y práctico. La reina Letizia se toma muy en serio sus tareas. I like this look alot! Love the shoes especially! 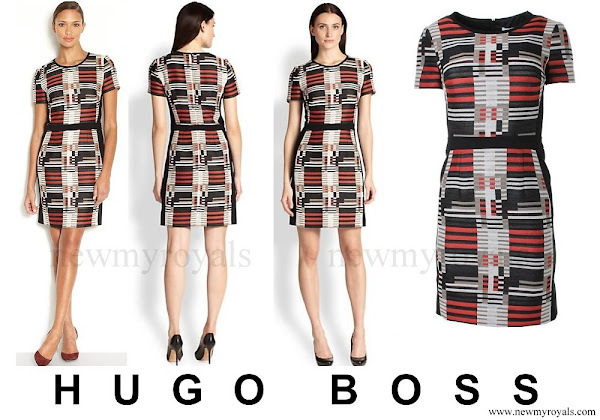 Nice pattern as a dress or a skirt. Nice shoes. Looks like a nice knit top. All together, this outfit is a horrible jumble of designs and colours competing with each other. The skirt and the top would have worked together with black shoes and while I believe the jacket overpowers Letizia's small frame the jacket would have worked with the shoes. Letizia herself is as always perfectly groomed. In my opinion, the outfit just doesn’t look well co-ordinated. A little bit diffenrent outfit - that's why I like it, but it would have been perfect with black jacket instead of this one in too big size. It is not too big, it is an oversize cut, which still fits perfectly, neckline, shoulders, length. Yes, you're wright, I looked once again, and I know now what bothered me: those folded up sleeves. This jacket is actually really nice, but for me with the full length sleeves. Queen Letizia usually makes smart fashion choices. Nice bold colors but still dignified and classy. Would have preferred black shoes, but nice fit for the jacket and skirt. A great look for a great, gorgeous Queen!!! Another good look from Letizia. Nice and warm colors, beautiful hair. Thumbs up from me! Does anyone know the designer of her shoes? Thank you!